Dumond’s rustic wood custom furniture pieces are handmade from Walnut, Cherry, Bubinga, Maple, Oak and other unusual woods. These are unique, unusual, artistic, one of a kind, custom, rustic wood furniture made to order!!! Contemporary Burl Claro Walnut executive custom table. 9.5′ L x 34 – 40″ W x 2.375″ Th. Natural edged and cut edges, single slab Burl Claro Walnut slabs make this beautiful custom executive table unique. The grain in the walnut is amazing. The base is walnut. Natural edged and cut edges, single slab Burl Claro Walnut slabs make this beautiful custom executive table unique. The grain in the walnut is amazing. The base is walnut. Contemporary claro walnut executive custom desk. Although contemporary, it also has a unique rustic appeal. Natural edged, book matched, Claro walnut slabs make this beautiful custom executive desk unique. The grain in the walnut continues across the top, and down the sides making for a continuous flow. Rustic Custom Knotty Cherry Custom Lawyers Desk now lives in Sun Valley, Idaho. A rustic custom lawyers desk in knotty cherry. This custom desk has six drawers including two file cabinet drawers. 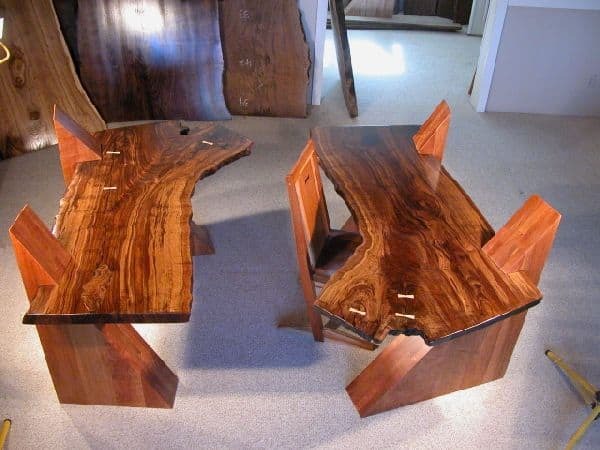 Size 30″ H x 72″ W x 34″ D.
Claro Walnut executive custom desks featuring walnut crotch slab top with quarter sawn sycamore butterflies, and double triangular solid cherry base. This modern/contemporary natural edged curly maple desk has a slight curve in its top which splays the triangular shaped legs outward. This adds visual interest to the piece. The upright triangular pieces are constructed of solid paradise tree. The whole custom desk is modular and comes apart for easy moving from place to place. American Black Walnut executive custom log desk featuring walnut crotch top, and natural edged cherry base, with walnut log feet . Natural edged privacy panel with ebony butterfly. This log desk was made to disassemble for ease of transport. 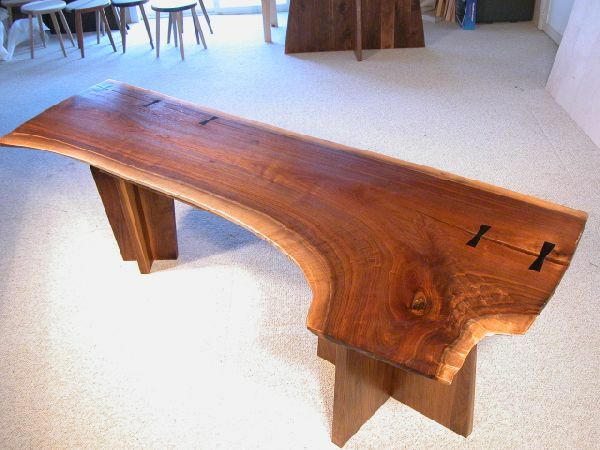 Beautiful, fully figured cherry slab with three tulip wood butterflies for accent in the top.